Winters seem to show no signs of abating. With kids growing taller every second day or hour – the clothes seem to be getting smaller and tighter just a tad too quickly. To protect the kids from all father Frost throws at us, they need to be bundled up in the warmest of winter wear. The kind that is comfortable enough to let them play in the snow for as long as they can. On that note, here go our top picks for the best winter coats for kids that keep them warm, and us parents at peace! The best winter coats for kids are the ones that keep them warm but comfortable and also have space for the kids to grow into. Plus, the more affordable, the better. So here go our top picks. We all want for our little boys to be at their warmest when they go whizzing in the snow. And to be fair, there is a lot of snow in the winters of nowadays. So while a good winter jacket or coat is great, a two-piece snow jacket and pantsuit is even better, right? Because this can truly keep them warm just about anywhere. The material is 100% Polyester but that means it will keep the wind, the chill, and moisture out. 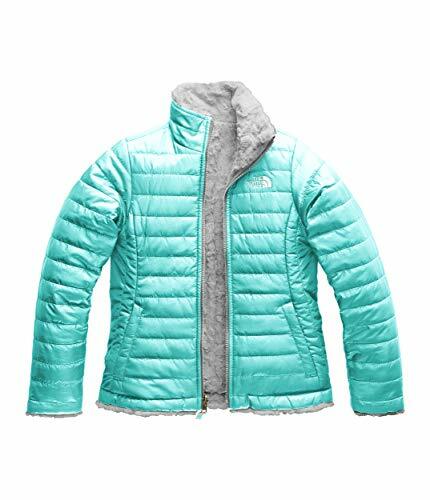 The jacket is fleece lined and comes with a heavyweight filling so it will definitely ward off the chills. This makes it one of the best winter coats for kids. The jacket is designed in sporty blocks of colors with a contrasting fleece to look good and bright. The bright colors make them the boys easy to spot as they play in the snow. The pantsuit comes with straps to loosen for easier play. It is also zipped in the front to make it easy for little boys to get in and out of it, and also for ease of going to the bathroom. The pantsuits match the contrasting dark color on the bottom of the jacket and are also heavyweight filled to keep the kids truly warm. The jacket and pantsuit set comes in a combination of six colors. The pantsuit varies in shades of blue, black and grey while the jackets are bright in red, orange, yellow, blue, green and silver. Most consumer reviews do point to the fact that the pants tend to be slightly tight at the crotch so maybe buyers should consider a size larger than what they would usually buy. However, most reviews are great though there have been some complaints about zipper quality and so. 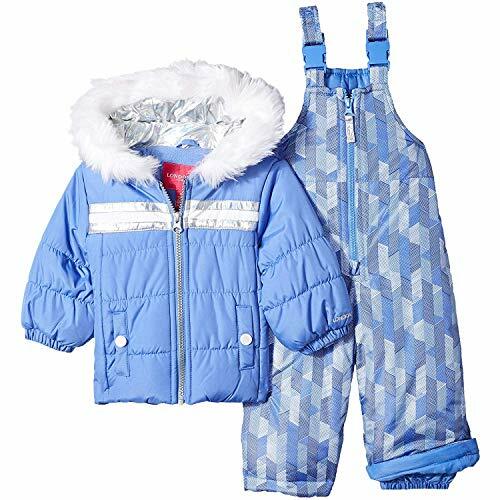 The London Fog snowsuit for girls comes in way brighter and more beautiful colors. Like the one for boys, it comes with a jacket, a pantsuit, and a snow bib to keep the snow out. Much like we want our little boys to stay warm and protected, we want the little princesses in the family stay safe in cold too. London Fog offers the same 100% polyester material in the girl’s version of the jacket and pantsuit combination. Both the jacket and the pantsuit are heavyweight filled for maximum warmth. There’s elastic on the ends to keep the snow out as well. The pantsuit comes with the same straps and zipper for ease of wear but the girls’ pantsuits are not just plain but printed too. Two of the color options have unicorns printed on them while two are plain. Two more have geometric designs on them. The lining in these jackets is fleece and comes in plain or printed options, while the hood comes with an attractive fur trim to really please the little darlings. Most of the jackets also have an added design element embroidered in to look fashionable while being warm. The best thing about these warm and best winter coats for kids is that they are machine washable so having them go wet or muddy isn’t a problem considering they can be washed and dried in a jiffy. Consumers seem to rate this one highly as well, though the same sizing issues remain so better to go for a size larger in case your child is taller than average. There have been a few complaints about the leg openings and the sleeves riding up due to lose elastic as well. One of the best winter coats for kids is, of course, the kind that keeps them warm, but also affordable enough not to pinch when the kids sprout. And from age 5 to 15, they do sprout like little seedlings determined to reach the sky. Now the conundrum here is that you also want a winter coat that keeps the cold out, and affordability can sometimes become an issue here. 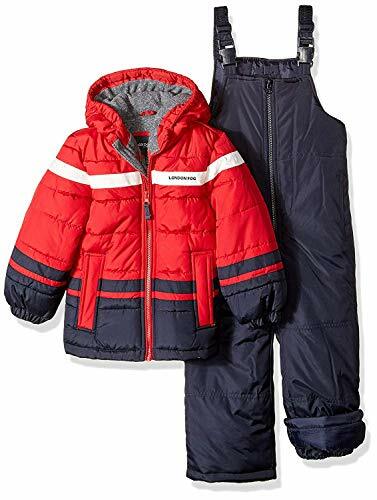 This is why the Amazon Essentials Lightweight Packable Puffer for Girls, and for Boys becomes a must have for growing kids’ winter wardrobes. At $35, it is as affordable as you can get and nowhere does it skimp on quality or warmth. The polyester down insulation keeps the kids warm and cozy while the nylon lining is smooth and non-irritating. On relatively warmer days when hell isn’t trying to freeze over, this jacket can be paired with a tee or a cotton jumper. On colder days, pile it as a top layer with thermal wear, sweaters, and sweatshirts. And for really cold days, you can add a layer of something warmer on top of this jacket, making it one of the best winter coats for kids on the whole. The cuffs are elasticized to keep the warmth in and once winters are all done, you can pack it away in the included sack for safe storage. What many really love about this jacket is the amazing range of colors. There are some nine colors for girls, including a navy blue jacket printed with stars. There’s the whole range of basic blues, blacks and all shades of powder colors that girls love to flaunt. And you can get this for the boys too, in 11 amazing shades, including a camo print that will find a place in all boys’ winter cupboards. So with 20 colors including two prints in total, there isn’t a child who could not find his or her favorite color in this affordable winter coat. The fabric and the down is 100% polyester while the lining is 100% nylon. It is machine washable as well, so there’s that ease of getting it clean and dry quickly. Have you ever wished for a jacket the kids could wear both in the mildest and the coldest of winters? Well, the Columbia Whirlibird Ii Interchange Jacket is just that with its three-in-one combination. For the coldest of days, this jacket is best-worn fully-assembled with the coat being a waterproof and a wind-breaking shell worn on top of an insulated inner jacket. When worn as a set, this can be the best winter coat for kids in just about the severest of winters. The outer shell can be worn alone on milder but rainier days as wind and wetness protection. Of course, when the skies are clear but the cold is chilling; the inner jacket acts as a warm puffer coat since it comes filled with synthetic down. 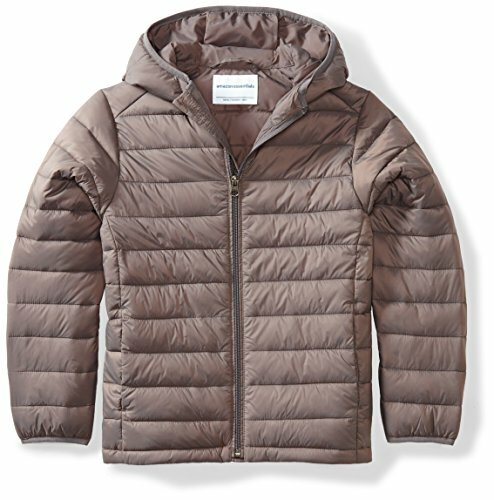 Another great thing about the inner jacket is Columbia’s patented Omni-Heat Reflective system that features an array of metallic dots on a thermal, reflective liner that radiates heat back towards the body, but keeps it all breathable. Basically, this is one of the best winter coats for kids because is warm and cozy minus any bulkiness. Both the boys’ and the girls’ options come in four prints and two block color combinations each. Thee boys’ prints head into adventurous territory while the girls’ wear prints are floral and bright. The jacket is a tad pricey, retailing from $80 to $190, depending upon sizes and patterns, so this may pinch a bit when the kids outgrow it. But it will keep them snug as long as they fit into it. Sizes come from babies just a month or so old, all the way to sweet sixteen. The best thing about these jackets is that the lining is so soft and cozy; the kid may never fight you about wearing a jacket ever again! Because while the cold should ideally make kids wear their warmest on their own, more often than not jackets feel itchy, scratchy and uncomfortable. Enough for the younger ones to really kick up a fuss about wearing one, though logic demands they don’t. But when do kids listen to logic? However, the fleecy softness of these reversible jackets from North Face means that most children love to wear them, considering they can be worn inside out. The fleece side also has two welt pockets, making it ideal for kids to feel snug in these in severe winter days as well. Prices range from $77-220, making this one expensive buy. But if it finally makes your little princess or prince step out in the bitter cold in fashionable warmth, it may even be worth it. The cuffs of the sleeves are elasticized to keep any larger size issues at bay but most have found this jacket roomy enough to last a couple of years. The fleece side works for the cold but dry winter days since it cannot keep the water out. The waterproof taffeta or polyester side works on wet, snowy days and the inner fleece can then keep the kids doubly warm and cozy. The only issue being, the Mossbud Swirl is a girls’ only offering from North Face, as is apparent with the curvy stitching of the jacket. They come in fantastic shades and prints and have some 17 options for the fashion divas to choose from. 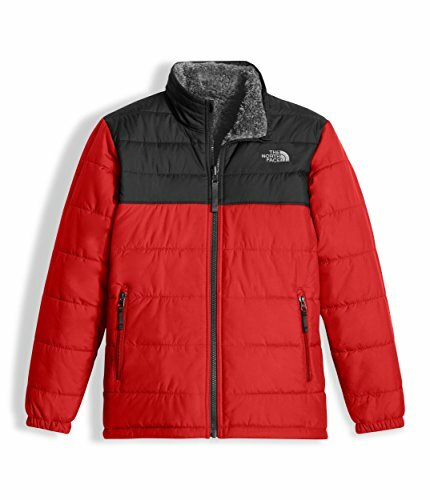 For the boys, parents could go for The North Face Boy’s Reversible Mount Chimborazo Jacket instead that comes with Sherpa fleece on the inside and is completely reversible for smart comfort. 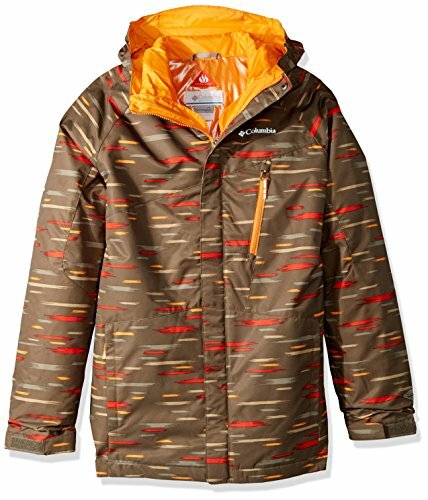 The Chimborazo jacket comes in two plain shades, two color-blocked ones and two printed options – all with horizontal quilting on the polyester side. It also retails cheaper, from $80-100 for better economic value. Be Warm, But Adaptable: The weather is never a constant. The temperature and frigidness of winter can vary a lot between the morning, noon and the evening. So you need a coat that is adaptable and can be built up or down in layers when need be. The best winter coats for kids should be the kind that can multitask effectively between mild and severe winters, along with keeping them dry when it rains, hails or snows. To keep kids healthy, winter warmth is essential and good winter wear provides just that. And there are always the caps, winter gloves, and scarves to layer the kids with. Be Comfortable And Cozy But Not Bulky: Children move a lot are pretty action oriented, especially in their younger years. The best winter coats for kids have to be the ones that keep them warm and protected from the elements but at the same time let them have freedom of movement too. What good is a warm coat that feels like a straitjacket, binding and uncomfortable? Or lets the wetness of rain or snow in? Be Long-Lasting And Wear-Resistant: Now that’s another thing about kids wear, be it winters or summers. Kids wear has to be as quality-conscious as adult wear is, and then some. Kids lead a far more active life than us, so they need clothes that can take all their rough and tumble with ease without showing age and wear. The best winter coats for kids will need to be tough, long-lasting and wash resistant as well – because if the fabric begins to fray, then what good is a coat? Be Stylish And Smart: Winters already makes us all feel dull, drab and dreary. The kids love their occasional snow day but there’s nothing like summers, right? On top of that, if kids have to dress in dull, dark and dreary colors; they are likely to feel even worse. Winters demand bright colors and happy outfits to cheer up the kids, and their parents, so obviously the best winter coats for kids also have to be the smartest. Be Easy To Wash, Dry And Store: The biggest pain of most mommas. How to keep their kids’ clothes in ship-shape whilst they are being worn. And later, when winters are over, how to put them in storage. The best winter coats for kids are the ones that are machine washable and dryable so that spills and stains can be taken care of in a jiffy. This way, a snowy-muddy day doesn’t tell on their clothes, and you can dress them in the same comfortable warmth the next day round as well. Also, coats and jackets that are easily storable is an added plus. Have Room To Grow: Kids tend to sprout every now and then. Ask any parent and they will have stories about how their kids’ growth spurt meant a whole wardrobe change for them, that too on no-sale days! It can and does happen at times. But coats should be a little large, but not lose. The idea is to have space enough for the kids to grow into the coat and then grow out of it. A size larger generally works better as long as it does not hang loose. This also gives you a chance to layer more beneath the coat in case winter turns its frostiest best! Not Too Expensive A Buy: No parent doesn’t want to spend on their kids. But kids grow and grow out of their clothes pretty quick in their earlier years. So you want a coat that keeps them safe and sound but also doesn’t pinch the pocket too much when it grows too tight. Affordability does become a big factor while shopping for growing-kids clothes. Sets, layers jackets and reversible coats will be more expensive on the whole but then variety will be chargeable. Down Fill Vs. Synthetic Fill: This is often another thing to consider while buying coats and jackets because each comes with its own set of advantages and disadvantages. Down is all-natural and so better for the environment, while synthetic fill is cheaper and quicker to dry. 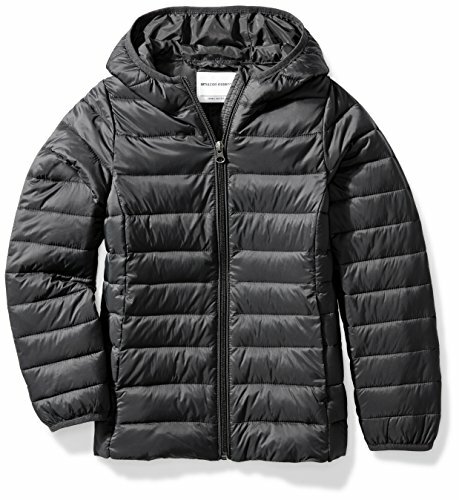 Down jackets are also more expensive, as is anything natural vs. anything synthetic. However, they may not work so well in humid and moisture-rich conditions, unless its hydrophobic down (down enriched with water repelling properties). On the whole, both last the same, are impossible to differentiate by hand and are equally warm. The North Face: Founded by two hikers who understood the need for non-bulky clothes, The North Face brand’s mission remains unchanged since 1966. They want to provide the best gear for the modern day explorer and keep people in touch with nature. And the more the children remain outdoors, the more they can do about nature preservation, once they all adult up. Patagonia: Once, Patagonia was a small company that made tools for climbers. And till today, it makes plenty of stuff for the people with alpine love at heart. In doing so, it also manages to churn out really warm clothes perfect for being in the outdoors and indulging in winter sports like skiing, snowboarding, and trekking in the snow. Columbia Sportswear: Columbia Sportswear was founded in 1938 in a bid to let people enjoy the wintry splendor of the Pacific Northwest. The idea was to make clothes that are warm and keep the wearer dry. Their ingenuity has carried onto into making rugged and warm kids clothes too. London Fog: In 1923, London Fog was founded as Londontown Clothing Company by Israel Myers, and they soon started to make waterproof coats for the US army. Later, they partnered with DuPont to create a waterproof fabric and in the 60s, the London Fog brand was launched. Amazon Essentials: Need we say anything about Amazon? The brand Amazon Essentials is all about the basic stuff, made with affordable prices and top quality. The idea is to make clothes that last long, look great and function well, but do not pinch the pocket! Q: What size of winter coat would be best for my child? A: Frankly, there is no one size that fits all. Each brand, while towing the international standards of sizing does have enough of a sizing difference with another brand. So the size that fits your child in one brand may be too big, or too small in another brand. Always check the size chart of the particular brand you are ordering the best winter coats for kids from. Also, try and keep a 10-15 day space for any returns/exchanges as well. This will make sure your child or children have the best winter coat to sail them through the frigid cold. Warmth will keep them well and healthy. Q: What kind of winter coat or jacket would be best for my child? A: This is pretty subjective to your child’s age, the kind of winters you face, and the child’s comfort as well. When it comes to dressing your children warmly for the winters, one has to keep many factors in mind. As a basic rule, babies and toddlers need one more additional layer than older kids and adults for complete protection. It’s better to layer children rather than slipping them into a bulky outer coat. Layering will give them more warmth and yet be breathable as well so as to not overheat them. While it’s important to keep the kids warm, remember to dress them in the kind of winter coat you yourself would be able to wear. Too bulky a coat could hamper their movements and make them irritable as well. There are many combination sets available in the market today. These have the advantage that they can be built up or down in layers, and so can be transformed according to the demands of weather. These become the best winter coats for kids because of their ease of wear for just about any degrees of cold. If you face light winters, go for a lighter coat. But if the bitter freeze in your state, transformable coats will work best. Q: Are reversible winter coats and jackets any good? A: The reversible coats and jackets available today have been designed in mind keeping the comfort and coziness of the little ones as a top priority. And they are fully reversible as well, making sure that the styling of the jacket or coat does not go for a toss. Both sides have pockets for little ones to snuggle their hands into. Both sides also carry the brand’s logo as well, as well as other embroidered areas and patches for the style. The reversible coats do make sense because one side is often waterproof for wet winter days while the other side (usually fleece) is for dry winter days. Q: What sort of money should I shell out for the best winter coats for kids? A: This varies greatly depending on the kind of down in the jacket as well as the size of the coat or jacket. Of course, the brand you want to buy winter wear from also matters when it comes to price. Natural down will be more expensive than synthetic fill, so that’s one point to consider. And there will be expensive brands like The North Face and Columbia that will give you the best winter coats for kids but range from $70 to a whopping $200. The jackets are definitely worth the price, but for kids on a growth spurt – they may just last a season! Amazon Essentials is another great and affordable brand, even if the clothes tend to be on the simpler and adequate size. It does boil down to budget as well. As long as you buy a winter coat that keeps your kids warm, comfortable and happy in the freeze – they are the best for you. If all you plan to buy for winters is that one coat, we suggest you go for the Columbia Whirlibird Ii Interchange Jacket. The reasons are manifold. It’s a coat that can be built up in layers for intense cold and slowly built down for milder winter days. The outermost layer also works for mild but wet winter days in keeping the kids warm and dry. Now this winter coat may err on the dearer side of things, meaning it is expensice. However, it may work best because you get three jackets out of it instead of just one. If budget is an issue, then the Amazon Essentials Puffer jacket works great. It comes in a whole array of colors and is perfect for not-so-cold days. And on days the chill doesn’t seem to go away, you can always layer this very affordable jacket with a waterproof windbreaker. The London Fog coat and pantsuit works great for days children want to play in the snow. It can keep them warm from top to bottom, and also has a snow bib. For the kids who hate anything scratchy, bulky or uncomfortable, you may have to shell out more. The answer may be the expensive but worth it reversible jackets from The North Face. The fleece will keep them warm and cozy while the other taffeta/polyester layer will keep the moisture out. Ultimately, kids have a very firm say in what they like to wear or not, and parents need to take their comfort, warmth, and choice into consideration. Along with the obvious thing, the budget. As long as the coat is good quality, and has enough filling to be warm, it’s great. If it makes the child and your pocket feel warm and snug; it is the best winter coats for kids.